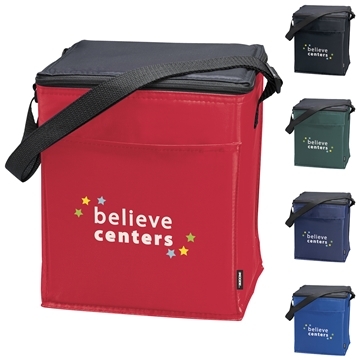 A day in the sun will be double the fun with our KOOZIE® Scout 12-pack Kooler. Keeps cool with ice packs. Zippered main compartment with front slip pocket. Shoulder strap adjusts to 40". Overall a great return on our investment. this product looked elegant and was very sturdy. We really liked the colors and clients loved them. The thickness and size is perfect. It's not thin like I expected. It's fitting to the concept of the Department that needed them. Really liked them very much. Great buy, nice size. I fix labels for everyone with their name, the school name and mascot on it. People from other schools see them at meetings and often ask about them. They want to get them,too. Attracts almost everyone. Purchased them for a tradeshow giveaway.